The German federal election on 24 September is the next major event in the Eurozone election cycle, ahead of Austria (Oct 2017) and Italy (early 2018). Citi analysts expect Angela Merkel to remain chancellor for four more years. Recent polls suggest continuity. Chancellor Merkel's CDU and its Bavarian sister party CSU are polling around 39%, the second place SPD at 24%. The Left Party features in third place with 9%, ahead of the liberal FDP, the Greens and the right-wing AfD with 8% each. Germany's risk of political disruption looks small. No significant radical party polls above 10%, and none has a discernible uptrend. With only 1.5 months left to election day, the chances of the Left Party or the AfD entering government, let alone a dramatic shifting in German policies, looks negligible. 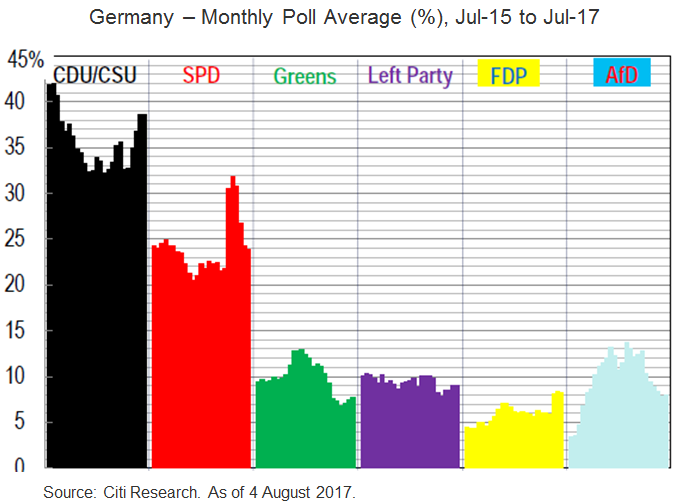 Citi analysts expect Angela Merkel to be re-elected as Chancellor for four more years, with the only open question being whether she will be at the helm of another grand coalition with the SPD or a new coalition involving the Greens, the FDP or both. Irrespective of which coalition Merkel heads, Germans can potentially look forward to at least two rounds of tax cuts. In 2018, middle-income households are likely to benefit from income tax reforms worth at least €15bn (0.5% of GDP) per year. In 2020, the solidarity tax expires, which could add another €10bn (0.3% of GDP) per year to household incomes. Public investment could also rise by around 0.2% of GDP from 2018. Citi analysts expect the energy, transport, digital, education and defence sectors to benefit.